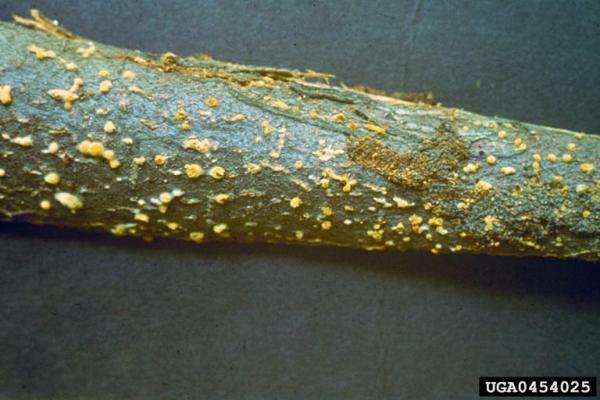 The US Forest Service (undated) states that, \"C. parasitica forms yellowish or orange fruiting bodies (pycnidia) about the size of a pin head on the older portion of cankers. Spores may exude from the pycnidia as orange, curled horns during moist weather. Stem cankers are either swollen or sunken, and the sunken type may be grown over with bark. The bark covering swollen cankers is usually loose at the ends of the canker. Trees die back above the canker and may sprout below it. Frass and webs from secondary insects are common under loose bark.\" Davelos and Jarosz (2004) state that, \"C. parasitica branches are killed when a canker girdles the stem disrupting phloem transport and cambrial growth. As the pathogen cannot enter the root system, genets survive and new sprouts are produced from the root collar. The epidemic is perpetuated when the sprouts become infected. 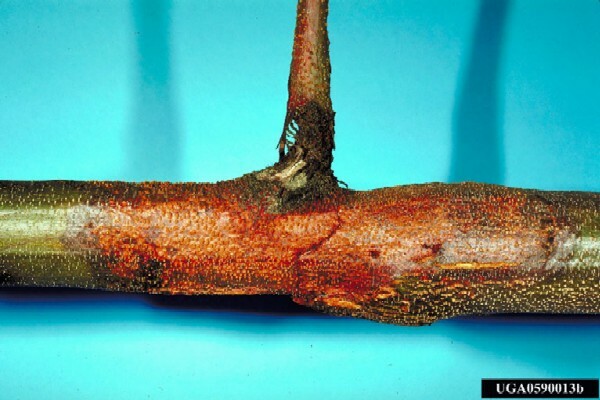 An intracellular hyperparasite of C. parasitica can alter the interaction between chestnuts and blight.\" Davelos and Jarosz (2004) state that, \"C. parasitica infection occurs most commonly at branch points, where movement creates small wounds that allow the pathogen to enter the tree. Individuals less than 50cm in height are only rarely infected and disease incidence increases with plant size, presumably because of an increase in the number of potential wound entry sites.\"
Please see PaDIL (Pests and Diseases Image Library) Species Content Page Fungi: Chestnut blight for high quality diagnostic and overview images. Davelos and Jarosz (2004) state that, \"The blight pathogen, C. parasitica (Murrill) Barr, was introduced into the United States from Japan (Milgroom, 1995; Milgroom et al., 1996) around 1904 (Merkel, 1905) and rapidly spread throughout the range of the American chestnut, Castanea dentata (Marsh.) Borkh. Heiniger & Rigling (1994) postulated that the natural spread of hypovirulence in Europe has led to a decline in the severity of disease and has allowed many stands of European chestnut to recover. Many attempts have been made to introduce hypoviruses as biological control agents of C. parasitica in the eastern United States (reviewed in MacDonald and Fulbright, 1991), but they have failed to spread and contain the epidemic.\" The authors also state that, \"Naturalised populations of C. dentata occur throughout the lower peninsula of Michigan (Brewer, 1995). Populations originated from seed or seedlings planted by early settlers of the state. Blight was first reported in Michigan in the late 1920s (Baxter and Strong, 1931), and hypovirus was detected in the late 1970s (Day et al., 1977). In some cases hypoviruses have spread naturally, leading to recovery of some chestnut populations (Fulbright et al. 1983). \"The bark miner Spulerina simploniella (Lepidoptera: Gracilariidae) was found in coppice chestnut (Castanea sativa) forests in Greece but was not found in chestnut orchards. Its larvae mine under the thin periderm of young trees, 4–10 years old, while the stem bark is still smooth. Under normal conditions it does not cause any damage to the trees. However, when chestnut blight caused by Cryphonectria parasitica is present in the area, the insect may be an agent of disease spread. Experiments revealed that spraying of 23 pupation sites with a C. parasitica conidiospore suspension caused canker formation at a rate of 100% in the coppice chestnut forests of Mount Athos, North Greece. It is believed that rain during the pupation period (approximately May 23 to June 15) may deposit conidiospores on the freshly exposed phloem and cause cankers. This bark miner has been detected in several parts of Greece, however, always in intensively managed chestnut coppice forests. [ABSTRACT FROM AUTHOR] (Diamandis and Perlerou, 2005). Cryphonectria parasitica is a fungus that attacks primarily Castanea dentata and Castanea sativa although it can attack a variety of other hardwood tree species such as: C. mollissima, Alnus cordata, Ostrya carpinifolia, Carpinus betulus, Quercus pubescens, Q. petraea, Q. frainetto, and Q. ilex (Dallavalle and Zambonelli, 1999). Marra and Milgroom (1999) state that, \"Although C. parasitica functions nearly exclusively as a self-incompatible fungus in the laboratory, with extremely rare occurrences of self-fertilization documented (Marra, 1998), self-fertilization constitutes about 25% of the mating system in nature (Milgroom et al., 1993; Marra, 1998).\"The authors also state that, \"Self-fertilization occurs under both laboratory and field conditions in C. parasitica. The disparity between observations of frequent selfing in nature and rare selfing in the laboratory suggests that the mating system is under ecological as well as genetic control.\"
Guerin et al. 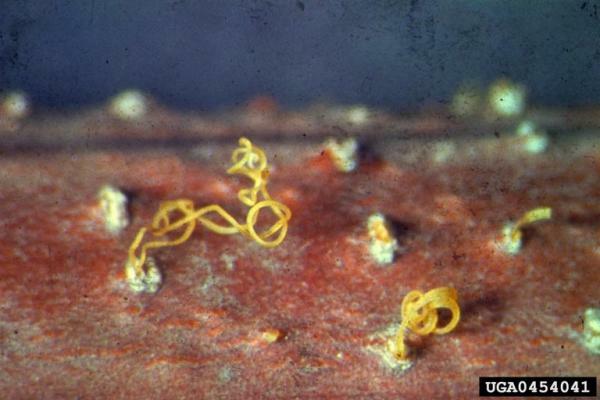 (2001) state that, \"Under American conditions, numerous perithecia (the sexual fruiting bodies of C. parasitica), maturing in stromata, were visible on the infected bark surface. Ascospores were discharged from these perithecia during periods of warm rain events in spring, summer and autumn. Discharged ascospores were further dispersed in air by wind and may be the source of primary inoculum each season. C. parasitica has a mixed mating system and both outcrossing and self-fertilization can occur within a population. Perithecia of C. parasitica occur but are not very frequent in most areas of Europe. More recently, in a survey of C. parasitica populations in Italy, the sexual stage was found in nine out of 10 populations, indicating the potential for sexual reproduction (Milgroom and Cortesi, 1999).\"
The Chestnut blight fungus was likely introduced to North America on nursery stock from Asia and was first observed killing trees in the Bronx Zoo (New York City) in 1904 (The Canadian Chestnut Council, undated). Review: Cécile Robin, Institut National de la Recherche Agronomique, Bordaeux, France. Recommended citation: Global Invasive Species Database (2019) Species profile: Cryphonectria parasitica. Downloaded from http://www.iucngisd.org/gisd/species.php?sc=124 on 22-04-2019. Cryphonectria parasitica has had a negative cascading effect upon native forest composition and diversity throughout most of the United States since its introduction. Davelos and Jarosz (2004) state that, \"American chestnut, C. dentata, was a dominant overstorey species in hardwood forests of the eastern United States of America prior to the introduction of blight (Day and Monk, 1974; Karban, 1978; Russell, 1987). In Southern Appalachian forests, the loss of mature chestnuts may have substantially reduced the forest's carrying capacity for certain wildlife species (Diamond et al., 2000). After the spread of C. parasitica, oak (Quercus spp. ), red maple (Acer rubrum) and hickory (Carya spp.) became the dominant overstorey tree species (Keever, 1953; Stephenson, et al., 1991). Today, chestnuts continue to be an important understorey species because of sprouts produced by extant tree root systems (Keever, 1953; Russell, 1987; Stephenson et al., 1991). However, infected sprout clusters exhibit reductions in survival and size, particularly when in competition with other hardwoods (Griffin et al., 1991; Parker et al., 1993). Vandermast et al. (2002) state that, \"Allelopathic qualities of chestnut leaves could have affected large areas of eastern forests. Chestnut foliage was dense, the leaf litter abundant and the leaves slow to decay ( Zon, 1904). Other studies indicate rain throughfall, dripping off live foliage, can contain concentrations of phytotoxic chemicals sufficient to inhibit germination of co-occurring species ( Al; Lodhi and Nilsen). With the abundance of competitive tree and shrub species in the southern Appalachians, it is possible allelopathy had an influence on maintaining chestnut's dominance in the region.\"
In Italy, Dallavalle and Zambonelli (1999) state that, \"There is a very high occurrence of chestnut blight on oak in the mixed woods of southern-central Italy where the pathogen still causes severe damage on chestnut ( Luisi et al., 1994). Although the occurrence of the disease on hosts other than chestnut does not involve damage to these trees it could play an important role in the epidemiology of the fungus.\"
Integrated Management: The American Chestnut Cooperators' Foundation (undated) states that, “Integrated management for C. dentata revival combines hypovirulence (by inoculation) with C. parasitica resistance (grafted) on sites identified as ideal C. dentata habitat, to produce C. parasitica control. 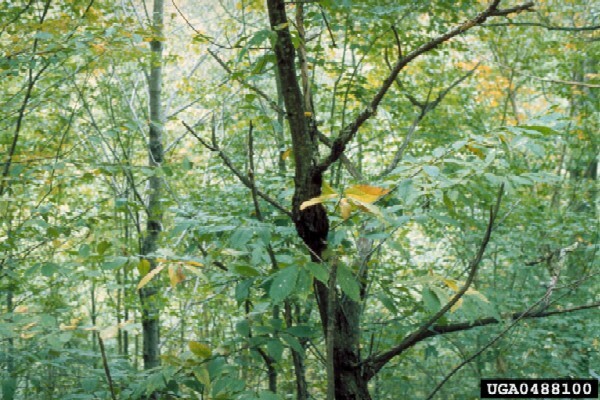 In Virginia's Lesesne State Forest, 3 resistant C. dentata were grafted in 1980. In 1982 and 1983 the first cankers were inoculated with hypovirulence. These trees are thriving; they have produced nuts for more than 10 years, and they make excellent annual growth”. .
For details on biological control options, please see management information. Informations on Cryphonectria parasitica has been recorded for the following locations. Click on the name for additional informations. American Chestnut Cooperators Foundation. Undated. Blight Fungus Virginia Tech: Department of Plant Pathology, Physiology & Weed Science. Summary: Website the describes the history of the fungus in the United States and also goes in its biology and covers the impacts and current research related to this species. Canadian Chestnut Council. Undated. Chestnut blight (Cryphonectria parasitica) The Cause of the Problem. Dalavalle, E., and A. Zambonelli. 1999. Epidemiological role of strains of Cryphonectria parasitica isolated from hosts other than chestunut. European Journal of Forest Pathology 29: 97-102. Summary: A scientific study that identifies species other than chestnuts which are affected by the fungus. Davelos, A. L, and A. M. Jarosz. 2004. Demography of American chestnut populations: effects of a pathogen and a hyperparasite. Journal of Ecology 92:675-685. European and Mediterranean Plant Protection Organization (EPPO), 2003. Data Sheet on Cryphonectria parasitica. Prepared by CABI and EPPO for the EU under Contract 90/399003. Frigimelica, G., Carpanelli, A., and Stergulc, F. 2001. Monitoring of widespread forest diseases in Friuli-Venezia Giulia (North-eastern Italy). Journal of Forest Science (Prague). 47 (Special Issue 2): 81-84. Summary: Monitoring of this species in north-eastern Italy. Groome, P.C., Tattar, T.A., and Mount, M.S. 2001. Bacteria found on American chestnut bark and their potential in biocontrol of chestnut blight. Arboricultural Journal. 25 (3): 221-234. Summary: Information on the chestnut blight in the USA and possible biological control options. Guerin, L., G. Froidefond, and X.-M. Xu. 2001. Seasonal patterns of dispersal of ascospores of Cryphonectria parasitica (chestnut blight). Plant Pathology 50: 717-724. Summary: Research paper covering the reproductive aspects of species. Gurer, M., Ottaviani, M-P., and Cortesi, P. 2001. Genetic diversity of subpopulations of Cryphonectria parasitica in two chestnut-growing regions in Turkey. Forest Snow and Landscape Research. 76 (3): 383-386. Summary: Information on chestnut blight in Turkey. Juhasova, G., and Bernadovicova, S. 2001. Cryphonectria parasitica (Murr.) Barr and Phytophthora spp. in chestnut (Castanea sativa Mill.) in Slovakia. Forest Snow and Landscape Research. 76 (3): 373-377. Summary: Information on chestnut blight in Slovakia. Liberato J R & Robin C 2006. Chestnut blight (Cryphonectria parasitica) Pest and Diseases Image Library. Updated on 22/09/2006 2:57:21 PM. Liu, Y. C., D. L. Basso, B. I. Hillman, S. Kaneko, and M. G. Milgroom. 2003. Evidence for interspecies transmission of viruses in natural populations of filamentous fungi in the genus Cryphonectria. Molecular Ecology 12: 1619-1628. Summary: Scientific study using biological control methods on species. Marra, R. E., and M. G. Milgroom. 1999. PCR amplification of the mating-type idiomorphs in Cryphonectria parasitica. Molecular Ecology 8: 1947-1950. Marra, R. E., and M. G. Milgroom. 2001. The mating system of the fungus Cryphonectria parasitica: selfing and self-incompatibility. Heredity 86(2): 134. Radocz, L. 1998. Chestnut blight Cryphonectria parasitica (Murr.) Barr and its biological control in Hungary. Acta Phytopathologica et Entomologica Hungarica. 33 (1-2): 131-145. Summary: Biological control of chestnut blight in Hungary. Radocz, L. 2001. Study of subpopulations of the chestnut blight (Cryphonectria parasitica) fungus in the Carpathian basin. Forest Snow and Landscape Research. 76 (3): 368-372. Summary: Information on chestnut blight in Hungary, Romania and the Ukraine. Robin, C., and Heiniger, U. 2001. Chestnut blight in Europe: Diversity of Cryphonectria parasitica hypovirulence and biocontrol. Forest Snow and Landscape Research. 76 (3): 361-367. Summary: Information on chestnut blight in Europe. Robin, C., Anziani, C., and Cortesi, P. 2000. Relationship between biological control, incidence of hypovirulence, and diversity of vegetative compatibility types of Cryphonectria parasitica in France. Phytopathology. 90 (7): 730-737. Summary: Biological control of chestnut blight in France since 1974. Seemann, D. 2001. Plant health and quarantine regulations of the European Union for Cryphonectria parasitica. Forest Snow and Landscape Research. 76 (3): 402-404. Summary: EU quarantine regulations for this species. Summary: Research paper that investigates some of the long term effects on forest composition in the United States that the fungus has caused. Worrall, J. 2004. Chestnut Blight. Forestpathology.org: USDA Forest Service, Rocky Mountain Region, Forest Health Management. Diamond, S.J., Giles, R.H., Kirkpatrick, R.L., and Griffin, G.J. 2000. Hard mast production before and after the chestnut blight. Southern Journal of Applied Forestry. 24 (4): 196-201. Summary: Changes in production of Southern Appalachian forests before and after the arrival of the chestnut blight fungus. Gouveia, M.E., Cardoso, P., and Monteiro, M.d.L. 2001. Incidence of chestnut blight and diversity of vegetative compatible types of Cryphonectria parasitica in Tras-os-Montes (Portugal). Forest Snow and Landscape Research. 76 (3): 387-390. Haltofova, P., and Jankovsky, L. 2003. Distribution of sweet chestnut Castanea sativa Mill. in the Czech Republic. Journal of Forest Science (Prague). 49 (6): 259-272. Summary: First record of this species in the Czech Republic. Hoegger, P.J., Rigling, D., Holdenrieder, O., and Heiniger, U. 2002. Cryphonectria radicalis: rediscovery of a lost fungus. Mycologia 94(1):105-115. Summary: Biology anf genetics of C. parasitica populations. Myburg, H., Gryzenhout, M., Wingfield, B.D., Stipes, R.J., and Wingfield, M.J. 2004. Phylogenetic relationships of Cryphonectria and Endothia species, based on DNA sequence data and morphology. Mycologia 96(5): 990-1001. Summary: Phylogeny of Cryphonectria and Endothia species. Petkov, P., and Rossnev, B. 2000. Cryphonectria parasitica (Murril) bar of chestnut (Castanea sativa Mill.) in Bulgaria. Nauka Za Gorata. 37 (4): 83-86. Summary: Information on chestnut blight in Bulgaria. Schmitz, D.C., and Simberloff, D. 1997. Biological Invasions: A growing threat. Issues in Science and Technology Online. Summer 1997. Summary: Article about biological invasions and their impacts.